Chop bell peppers, celery and onions. In a 3 quart oven pan, mix hamburger, crackers, 2 cans tomato sause, black olives, chopped bell peppers, celery, onion and eggs, salt, pepper and other seasonings to desired taste. Preheat oven to 325 degrees. 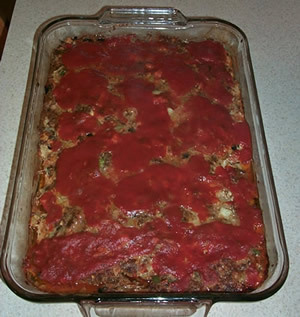 Place meatloaf in oven and cook for about an hour. Drain excess grease. Pour the 3rd can of tomato sause evenly over the top and place back in the over for another 20 to 30 minutes. When I am preparing the meat, I like to add some A-1 Sause and a smaller amount of Worcestershire Sause.